I didn’t always love oatmeal. In fact, I used to be disgusted by the mere mention of it. In my mind, it was something old people ate. I loved things like cereal and granola! Oh how things have changed! Both Vishnu and I could eat oatmeal several times a week now – breakfast, lunch or dinner. Sometimes we even crave it! We aren’t your plain oatmeal with fruit kind of people though. We like to jazz things up with peanut butter, chocolate chips, walnuts…and eggs. Yes, you read that right. We whisk eggs into our oatmeal. This is definitely one of those don’t knock it till you try it kind of things! Now, I know what you may be thinking. Adding an egg to hot oatmeal = scrambled oatmeal. Not the case if you whisk furiously for a minute or two. And when I say furiously, I mean it! Vishnu’s idea of whisking involves taking the whisk and ever so gently moving around whatever is in the pan. That, my friends, will get you scrambled eggs in your oatmeal. My husband learned that the hard way! But seriously, when you take quick oats, a mashed banana, a whole egg, plus a few other fun ingredients, you get the perfect eggy banana bread oatmeal. It’s so good that you will find yourself making it in the dead of summer! Think of your favorite banana bread recipe and now imagine it as a thick, creamy, and slightly sweet bowl of oatmeal. Every spoonful is delicious and comforting. The egg adds a little extra protein and acts as a thickener. AND as long as you exhibit some self-control with the toppings, this stuff is healthy! 1. Heat the milk in a small saucepan over medium heat. 2. As soon as the milk comes to a slow rolling boil, add the oats and mix well. 3. When the mixture starts to bubble, add the mashed banana and mix well. Cook for 2 minutes. 5. Add the vanilla extract and cinnamon and stir until incorporated. 6. Let the oatmeal cook for an additional 1 minute on low heat. 7. 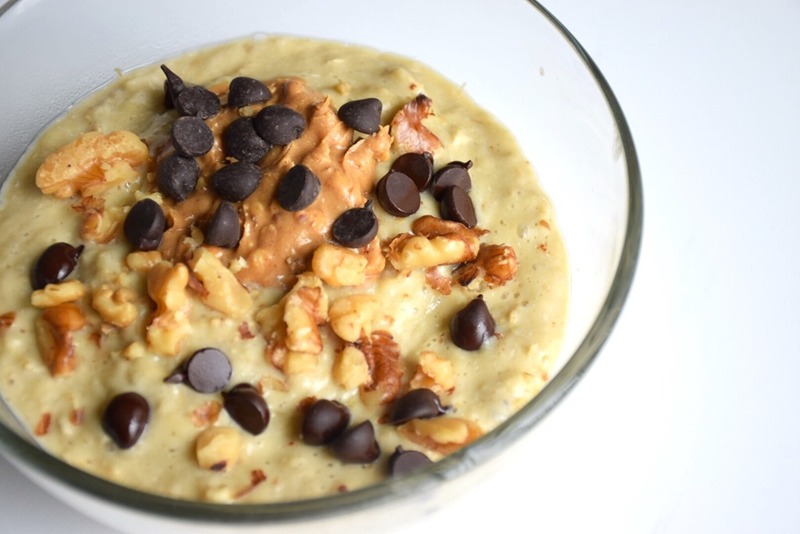 Transfer to a bowl, top with peanut butter, walnuts, and chocolate chips. This looks so yummy!!! Definitely will be giving it a try! Thanks for sharing the recipe. Thanks, Reshma! Let me know if you do! 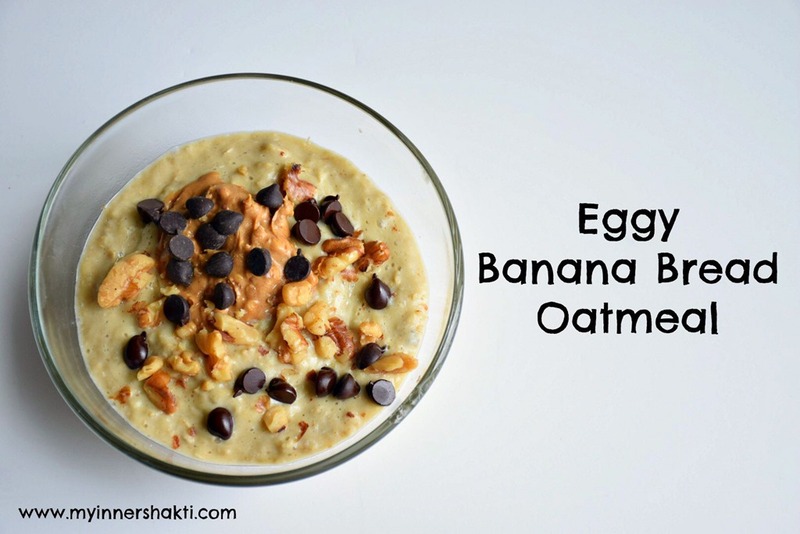 This looks so delicious- the more toppings the better with oatmeal :)! I’ve never tried whisking a whole egg into oatmeal but I almost always stir in egg whites- love how fluffy it makes the end result. Will definitely try adding in the yolk next time. As for my favourite toppings, those would involve banana slices & nut butter! I don’t think I could eat oatmeal with out PB! It’s a must have. I’m so intrigued by this! I’ll have to give it a try. I honestly never would have thought to put an egg in oatmeal. I love eggy french toast so I bet it would be so good in a maple cinnamon oatmeal YUM! Let me know if you do! And a maple cinnamon oatmeal sounds delicious! omg parita. this looks amazing! i’ve heard of egg in oatmeal, egg whites actually, but never tried it. i’ll give it a go. this will definitely hold you over for like 3-4 hours. Yummmyyy! I love adding cashews, cashew butter, cacao powder and a banana to my oatmeal!